1&2. How would you assess how the city has managed and maintained open space? What plans do you have in mind to improve this work? Would you support the administration’s request to create a Park Ranger position within the Recreation Department to help the City responsibly manage its forested parcels (many of which were acquired in recent years)? The City of Waltham has made great strides in preserving open space over the last 15 years. 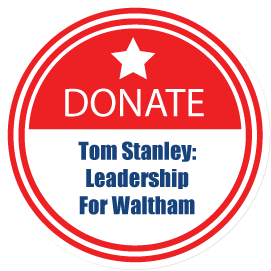 This would not have occurred without the guidance and leadership of the Waltham Land Trust (WLT). Unfortunately, the City of Waltham has put forth minimal effort to manage and maintain public open spaces, including the Fernald and Prospect Hill properties. While we have seen a few improvements, such as the installation of rest rooms at Prospect Hill, much more can and should be done to maintain these precious resources. To help the City move forward with preserving open space, I believe Waltham needs to create and fund a full time park ranger position which could eventually grow to include additional part time staffers to care for our public forested land. I supported this idea during my tenure as a city councilor and if elected, will do my best to make this happen. Additionally, state grants are available to help maintain and improve our open space. Prior administrations have actively sought this funding and I believe the City should reinstate these efforts. 3. Should Waltham Land Trust’s position on development (see below) guide the management of city-owned property? To best preserve our natural resources, I believe that the WLT position on development of city-owned property should be a guide for city officials. I support the city acquiring the Agrillo Farm off Beaver Street with Community Preservation Act (CPA) funding without further delay. Any development on the city’s open space should only be considered when there are no other options for conflicting municipal priority needs. For instance, if viable, I would have supported the creation of a new high school at the Fernald or Stigmatine properties. Both would prevent disrupting our students learning environment. I support building the new high school at the only viable location identified at the current site utilizing school property. I do not support building on the Storer land. I do not support taking property by eminent domain for a public purpose when other options are available. However, I do support a friendly purchase of the Stigmatine property to prevent future development on the site and preserve additional open space. Regarding the Fernald Property, I have fought for a comprehensive community reuse process to prevent over-development on that site. Personally, at a minimum, I have always believed that the majority of the land should be preserved for public open space and recreation. Any limited development ought to be for a necessary municipal need or minimal impact means to finance and maintain our open space and recreation. However, any reuse decisions must be made with a comprehensive and professional asset and reuse assessment with extensive public involvement and support. 4. The Waltham Land Trust continues to encounter people tenting/living along Waltham’s trails and open spaces. We are concerned about a potential lack of facilities for folks who need them. What will you do to help this situation? People tenting/living along Waltham’s trails and open spaces discourages the public from using these properties. Waltham needs to do more to provide services and create safe and affordable housing for folks in need. The Affordable Housing Trust Fund (AHTF) and CPA funded housing vouchers are underutilized. Builders ought to be required to incorporate a higher percentage of affordable units into developments rather than finance the AHTF. Additionally, we really need to focus on providing housing with supportive services for individuals facing addiction or in need of mental health services, which are both factors driving homelessness. We need to look at public spaces such as the former city dog pound on Felton Street. By turning this space into a homelessness facility, we can service and shelter those in need while at the same time discouraging use of public spaces such as the library, Waltham Common, Prospect Hill and the Charles River walkway for tenting/living.